Hey, you know who’s a cool dude? Luke muthalovin’ Daab. Not only is he a great visual artist, he’s also a great songwriter and performer. I can only assume he’s a great puppeteer, because he does that, too, and he seems to have a talent for whatever he decides to do. Needless to say, I hate him. Ha ha! Obviously that part’s not true – I’m a big fan of Luke’s and you should be, too, because not only is he producing lots of cool stuff for our enjoyment, but he’s also just a decent and generous human being. Why else would I get an out-of-the-blue message from him one day telling me that he’s at the Mighty Con in Madison, Wisconsin, and hey, someone’s got the LEGO Plastic Man mini-fig for sale and do you want it? And seemingly just like that, this happened. See what I mean? Luke Daab is the coolest. So be sure to go find our newest NBI agent (I really should get cards made or something) and support him at his main site, on Tumblr and on Patreon. 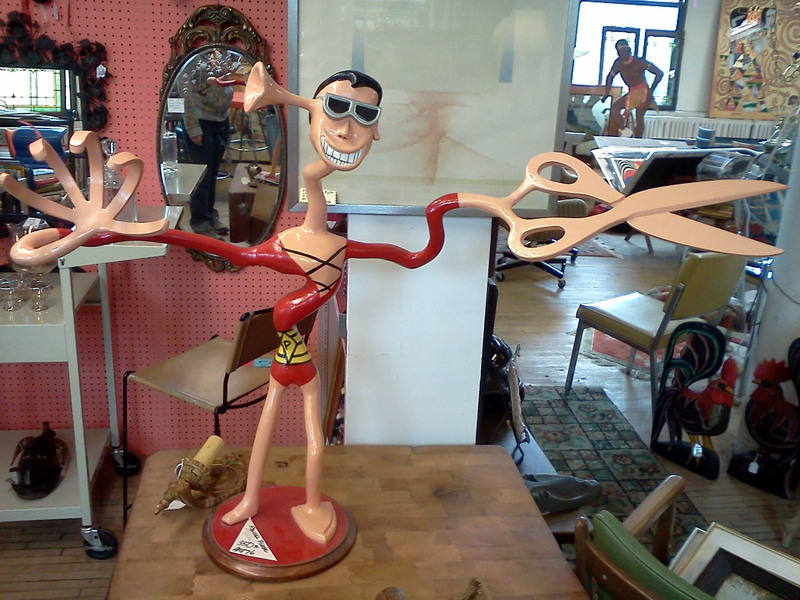 First up is this completely amazing Plastic Man statue pointed out to me by NBI agent Charles Ward. (What’s that? There’s a difference between Plasti-fans and Agents of the NBI? Oh, yes, there is.) I honestly don’t know what the original poster was talking about when he called it “bizarre and nightmare-inducing” – this is a thing of beauty. According to the author, the statue of Plas pulling off at least six simultaneous shape-changes is about three-and-a-half feet tall and was last seen taking up residence at an unnamed Milwaukee antiques store. According to our old buddy/nemesis Math, this picture was taken sometime in 2012, so it’s anybody’s guess whether it’s still there. But for my money, the $350 asking price is a bargain (and I’d bet you could talk it down to $300, at least). Going by what little information there is, I’m guessing the artist is Randall Fisher, though a quick Google search turned up nada. Does anyone know the artist, or recognize the store itself? I now have a burning desire to track down this art for the ages. Meanwhile … a short video produced by DC Entertainment recently went up over at Comic Book Resources that flashes through every member of the Justice League, from the team’s debut in 1960 to the present. And guess who finally shows up in 1998? 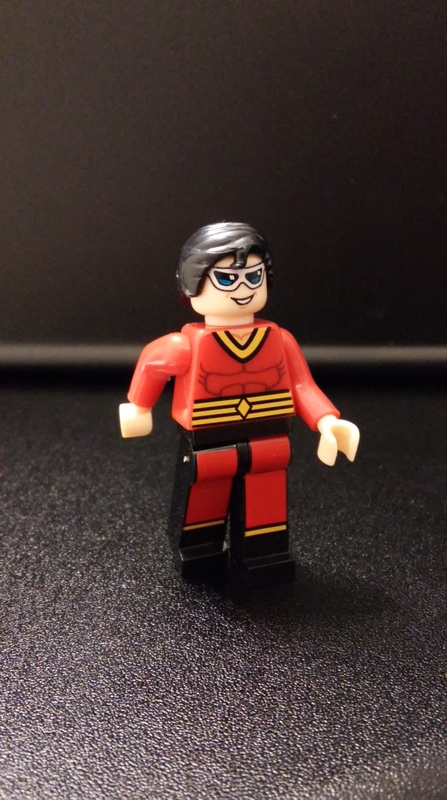 Honestly, I was surprised it had taken that long for Plastic Man to join the League – I’m guessing that chump Dibney was blocking his addition to the team from happening sooner, because it really seems like such a no-brainer. Thanks for nothin’, Elongated Man. Here’s the video, with Plastic Man showing up at the 2:09 mark; feel free to argue about which characters were left out of this “complete” listing. Charles Ward can be found on Facebook at his Plastic Man Fan Group page, and you can check out more from CBR at the website. It’s Le Gallerie Plastique et Woozy! Is that even French? 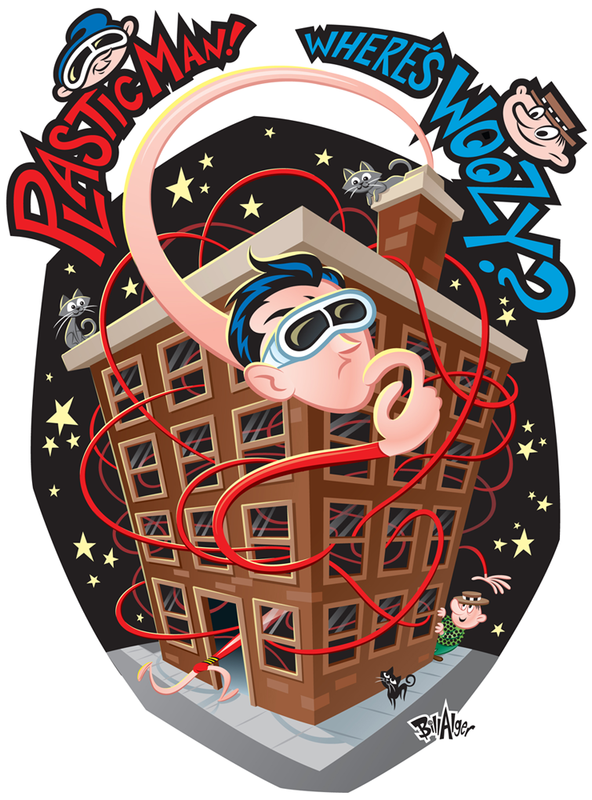 I honestly don’t know, but today we’ve got a sorta “Woozy Wednesday” and “Where’s Plas?” mash-up courtesy of this piece by Bill Alger. I like Alger’s simple, but expressive, lines, and a person could drive themselves crazy trying to follow that crazy-complicated path that Plastic Man has taken. Speaking of which, look at the great job Alger did on the shading and coloring to differentiate the building’s interior from the scene outside! For what looks at first glance like a basic, cartoony image, there’s a whole lot going on here. For more of Bill Alger’s work (including a drawing of Plas helping potty train a kid – no, really), make sure to visit his website.